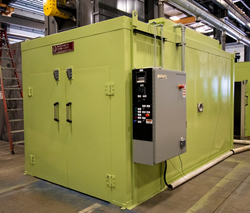 Wisconsin Oven Corporation announced the shipment of four (4) electrically heated enhanced duty walk-in ovens to an automotive parts manufacturer. These industrial ovens will be used for aging aluminum parts. “Here at Wisconsin Oven we understand that each of our customers have specific requirements for their application which is why we work with them to design an equipment solution that provides the optimal part result." The walk-in ovens have a maximum operating temperature of 260°C (500°F) and work chamber dimensions of 6’0” W x 15’0” L x 6’0” H. Guaranteed temperature uniformity of +/- 10°F at 200°C (392°F) was documented with a standard nine (9) point profile test in an empty chamber under static operating conditions. The aging ovens are constructed with tongue and groove panel assemblies that feature Wisconsin Oven’s patented high efficiency panel seams which provide 25% better insulating efficiency. The ovens are designed with horizontal airflow to maximize heat up rates and temperature uniformity of the product. Each of the industrial ovens feature bi-parting, side hinged, horizontal swing doors at both ends for loading and unloading of the product. The aging ovens were fully factory tested and adjusted prior to shipment from our facility. All safety interlocks are checked for proper operation and the equipment is operated at the normal and maximum operating temperatures. An extensive quality assurance check list was completed to ensure the equipment met all Wisconsin Oven quality standards. This equipment is backed by Wisconsin Oven’s Exclusive and Unprecedented 5-Year WOW™ warranty (parts only).